Adventures Pursuing the Schrödinbug; or, How to Debug Your Code. Earlier there was a thread about how to debug code, for which I really can't think of a good, succinct answer. There's quite a bit of an art to debugging code. Those of you who are intermediate and expert programmers probably have your own habits, strategies, and tools--but if you're a beginner then there's a grim reality you'll experience soon enough: You'll likely spend much more time fixing your code than writing it "fresh". The difficulty in writing a program scales up with its size--I'd say exponentially. So you really don't want to dive into a large project without having a few tricks up your sleeve. 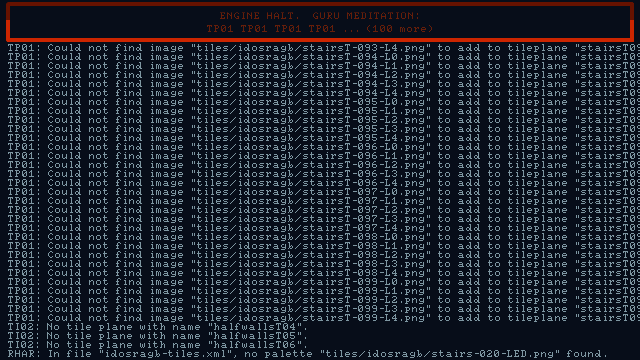 For that reason I thought I'd share what I do to manage the herculean task of debugging something the size of Idosra's Vallas Engine. The last time I counted, I had around 35,000 lines of code in 1 MB of .hx Haxe files. I've added and deleted a lot since then, but the grand total hasn't changed much. That puts it at around the same storage size as the Stencyl engine, although I tend to be wordier when it comes to comments. So there's a lot of room for something to break. If When Things go Wrong... The first principle I adhere to is controlled failure--anticipate where things might go wrong and fail on purpose to prevent a larger catastrophe. A good example of this kind of engineering is the case of the Boeing 737 fuselage. The B737 fuselage is lined with metal strips forming a 10in by 10in grid. Should a break in the fuselage occur in flight, the tear will be stopped by the metal strip, opening a small hole which lets the cabin depressurize. This controlled failure prevents the worse catastrophe of an explosive decompression. In my case, I have the debug console which has been featured in the starts of the last few videos I've uploaded. 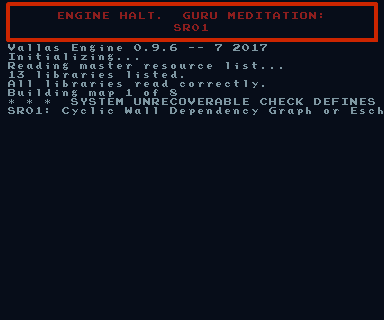 I've posted a few screenshots of the "Guru Meditation" errors, such as the one below. So what's going on is really pretty simple. Whenever I anticipate that a certain erroneous condition might occur, I put a bit of programming that sets an error code and an explanation string with more information. My rendering routine checks the state of the error codes. If there are no error codes stored, it displays the screen. 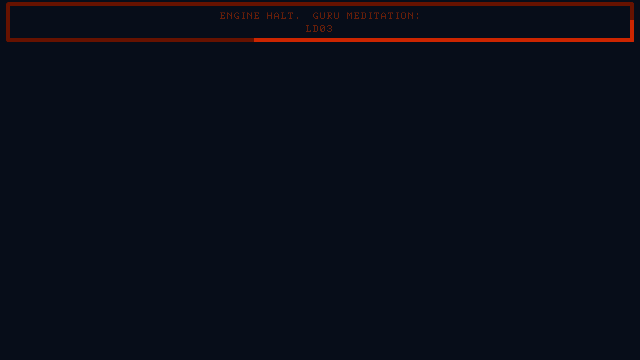 If there is an error code stored, it kicks out to the debug console and flashes the red "Guru Meditation" (which, BTW, is a play off of the Amiga system's "BSOD" type error). Most of the time these error codes prevent the much more ambiguous "Error 1009" / "Segmentation Fault" errors that are a pain to diagnose. The first two letters tell me what file to find the broken code in, and the last two give me something to search so I can pull that code up in a text editor. SR is Sector Renderer, and so is an error in the code that draws a room. The error codes are a means of controlled failure that often keep the running program alive long enough to help me figure out the root cause of a problem. As many of us have experienced, often finding the bug takes much longer than fixing it. Anything that helps you pinpoint errors faster is going to speed up your debugging efforts. So now... The Schrödinbug. What is a "Schrödinbug"? It's a cute little name for a type of bug--one of many (See Wikipedia entry). It's a bug that appears to lie dormant until the programmer notices the code shouldn't work. In actuality, it's code that never was correct, but the conditions for which the bug activates were not met. My Schrödinbug came to light as I was adding code allowing the player to walk out of one map and into another. I modified the 2x2 "testquads" map, that I used for AI testing, to have a map exit. In this case--it exits to another copy of itself, but the actual map used doesn't matter. Exiting forces a scene change, which is what I need to test. When I added my code to the rest of the player movement code, I noticed something was amiss. But--it's been working all summer. Surely there can't be an issue with it now? Entering the "testquads" map... all looks okay. A "character" is an entity that can exist on any map. Characters remain in memory no matter what scene/map is shown. Every character has a "VActor" instance, and every VActor has an "Actor" instance. An "Actor" is what you'd be used to from Stencyl--it's just a Stencyl actor. A "VActor" contains some additional data relevant to 3D physics and 2.5D rendering. It's possible for a character to not have a VActor, which would be the case if they're on a different map than the player is. When the map changes, I loop through all the characters and create VActors and Actor instances for the characters that are now on stage. Of course, since the player is always on stage, the player should always have a VActor and Actor instance. The fact that I could "hear" Marika suggested her VActor instance is still alive, since that's where movement code is housed. But what about her Actor? Is it gone? Did it somehow get pushed to the very bottom layer, under the floors? Did it get misaligned with the camera, so it's always off screen? There's so many possibilities here. Nope! At this point I already suspected what might be the problem, but "LD" is the last error I ever want to see. "LD" is "LayerDrawStack", which is the code that solves the "Sorting Stumper" problem I wrote about in April. "Elementary," said he. * So here's where we begin the detective work. I gave a technical overview of how rendering works in the "Sorting Stumper" link above, but the short version is this: Walls are drawn on layers and the layers are arranged in the right order from far to near. I compute the minimum number of layers needed to draw the walls correctly, and then compute which layer each wall should be drawn on. For actors, I basically draw them on the layer that the floor they're standing on is. There's a lot more to that if you want to read the details, but that's the gist of it. When any actor moves through the room, I have to check that they're drawn on the right layer. When this layer changes, I pull them from the old layer and push them onto the new layer. Error LD03 occurs when the code tries to pull the actor from a layer, but they're not on one. That would show up as either a crash or "Error 1009" without the error code, so LD03 is a lot more useful. I now know why Marika disappeared. She was pulled off of a layer, but never pushed onto a new one. And that error must have occurred when she walked through the door. So the "controlled failure" really did do its job. Imagine getting an "Error 1009" and trying to locate that. I think a lot of use have experienced that before. My next strategy is to go into the suspect section of code (the movement code that handles sector changes) and stick a bunch of trace/print statements. Basically, print out the value of every variable and look for something that is wrong. So what did it turn out to be? It seemed weird at first that adding a new door somehow "broke" another door, but once I got to the bottom of it, it made sense. It has to do with the "Growing Squares" algorithm that I use to partition the segments of the floors and walls into rectangles. By adding a new door, it just so happened that the layer in the new room that Marika would enter at was changed to Layer 1. In the starting room, the layer Marika leaves the room from is Layer 1. Now these are "different" Layer 1's: but the code wasn't checking it. To check if the layer an actor is on needs to be updated, it checks if the layer index has changed. When Marika went from Layer 1 in the old room to Layer 1 in the new room, the code didn't see the two layers as two different layers. Hence, when Marika was plucked from the old room, she was never inserted into the new room. When I walked her back, she couldn't be pulled from the room again and so the error flagged. I think it's really a story emphasizing how important beta testers are. What are the odds that the layers would align themselves just so precisely as to trigger that bug? I think it's also important to have these kinds of error codes for your released games. Had this game been released and one of my players told me they got an "Error LD03", I have a hope of fixing it. If they just told me "the game crashed", then who knows. In closing, it took me about four hours to diagnose this bug. The time it took to fix it? 15 seconds. * Fun Fact: Sherlock Holmes never said "Elementary, my dear Watson". Also, my last name is "Watson", and I never hear the end of that quote. This is pretty much how I do it. Problem with starting from ' fresh ' like you said is that in ' fresh ' code new bugs can emerge and you get into a loop. You are 'lucky' when you have a reproducible situation. The hardest bugs are the once that only happen when special conditions are met . What I did use was the HTML5 Console. There you can inspect variables and call functions. I use gdb as a debugger, but I haven't learned how to use breakpoints. I can get a backtrace from a core dump, though. It I put some intentionally bad code in the error handler then I can also get a backtrace of the events that led up to an error code being thrown. That's pretty much the only way I'm able to get the drawing related ones, like "LD03". I never thought about the HTML5 debugger, but that console sounds really useful. I made an HTML5 version of the game a while ago and it seemed to work. I didn't try any of the editors, though. Maps Monday. Speaking of editors, I made a map exit editor. Now it's easy to make doors into new maps! I have fond memories of hand-configuring each exit in each of the 113 rooms of the game jam version of "Temple of Idosra" via editing the .xml files. These exits are a lot easier to work with. I can give them easy to remember names and offsets are automatically computed. This map is "Foyer" and is one of the more complex maps I've made so far. It has about 25 sectors, multiple staircases, and twisty corridors. The back is dark and the front is brightly lit, which makes for a lot of rooms with deep contrast. Combat is in a terrible state right now, so I need to address that. I can't kill any of the golems without taking a lot of damage, in part because striking distance isn't well defined. There's no visual feedback on whether or not anyone's hits are connecting. The golems also react very quickly because there's no "wind up" time for their attacks. I haven't thought about these things in a long time, so I need to turn my attention back to them. 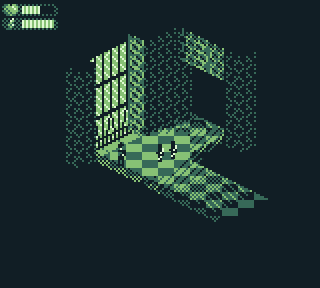 Gameboy Jam 6. 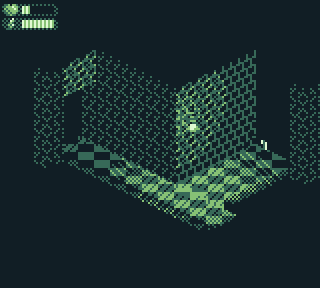 Against my better judgement I've taken the plunge into GBJAM 6. I'm not raising my hopes of finishing too high since the Vallas Engine is still missing several key features (like save-game!). Still, I've been working on this thing for a while, and it'd be nice to do something with it. Day 1: Creating all new assets. The 160x144 resolution will be tricky to work with. 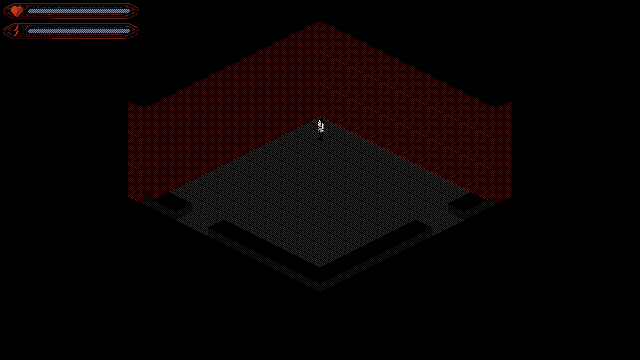 I can have tiny rooms and normal size sprites, or tiny sprites and larger rooms. 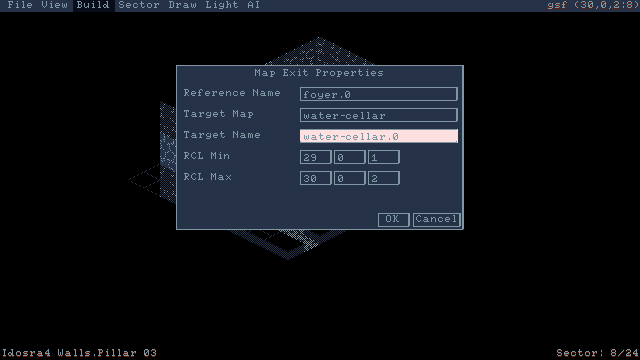 I've decided to go with the latter, since I'm not confident in-sector scrolling works well. 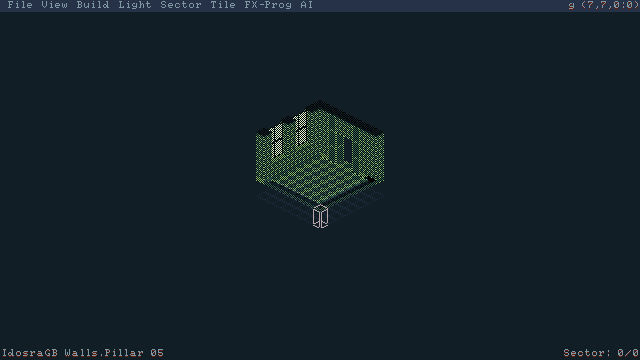 Even at that, I can have rooms 8x8 tiles at 16x24 tile resolution. Tiles are half the size as in the screenshots you've seen so far. But I have to make all new assets anyway in order to maintain compliance with the rules, so I'm not making unnecessary trouble for myself. In order to create the tiles, I draw the different faces and use Bash scripts and ImageMagick to combine them and create the different lighting versions. Most of the errors are a result of those scripts not assembling things correctly. If nothing else, I'll get some good housekeeping out of this. I cut about 400 out of the 600 actors in the project file because they are obsolete. One thing I'm very glad I had the foresight to do is program the rendering parts of the engine to work in tile units, not pixel units. I'm still going to have to go in and change velocity and acceleration values, since those are in pixel units... but that's not too bad. All physics data is specified in only a couple of places. The tiles are tiny! (Although the screen is actually twice as big as you're looking at here, since I scaled the image down 50%). I can't use the editor at the 160x144 resolution, so I'll have to change that when I'm done making the maps. Ah .. Bash scripts .. I have used ImageMagick in the past. They are very powerfull. You can create spritesheets and do all kind of tricks with images. Nice to read that there is another fan! work in tile units, not pixel units. That is interesting. I propbably should have done my 3d extention the same way. Well a bit too late for it now but I have to remember this for a future project!! ImageMagick is great. I use it for a lot of things. I recently discovered how to do batch processing with Audacity as well. To convert to grid, I have the variable gridRadius. It is a read-only variable. Specifying 'get' necessitates a getter function. Now I can use 'gridRadius' like any other variable, and it automatically multiplies the radius by whatever the tile size is to convert to grid coordinates (pixels) for that particular map and scale. Day 2. 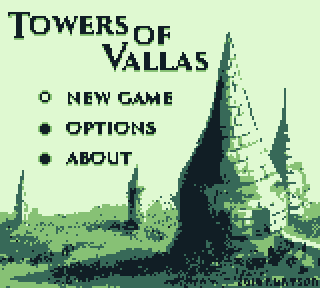 I now have a correctly rendered scene I've tentatively titled the game "Tower of Vallas", a throwback to the original "Thief of Vallas" name that got dropped. 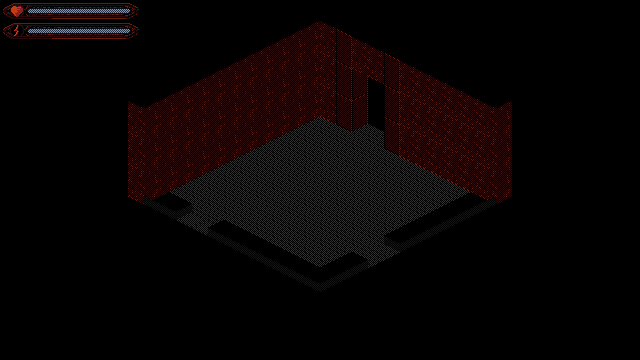 One thing that really helps speed up drawing tiles is lighting--I don't have to shade anything because the renderer does that for me. 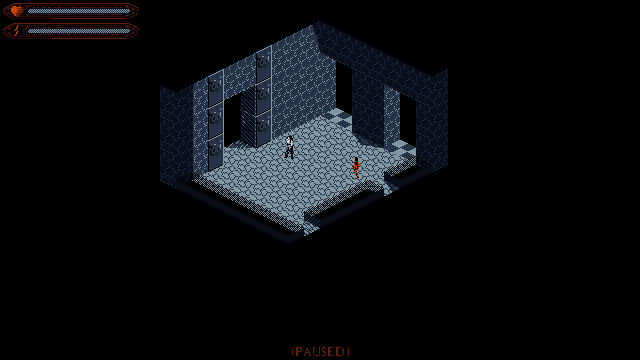 In some ways I like this new tileset better than the one I've been working with for Idosra. Idosra only had one kind of window, where as here I have several different kinds. 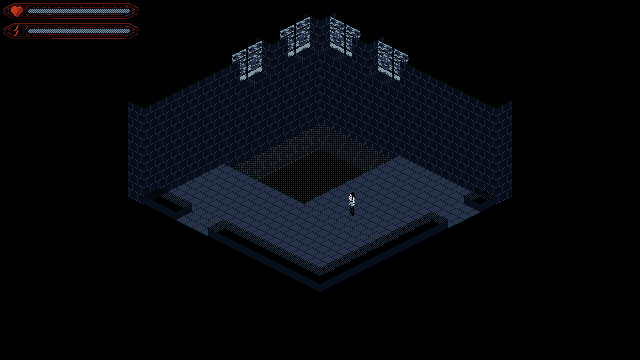 I don't have that many kinds of floors of pillars, though, but that's mostly due to the lack of room for any detail. Sadly, I don't have enough detail for the cat face walls. 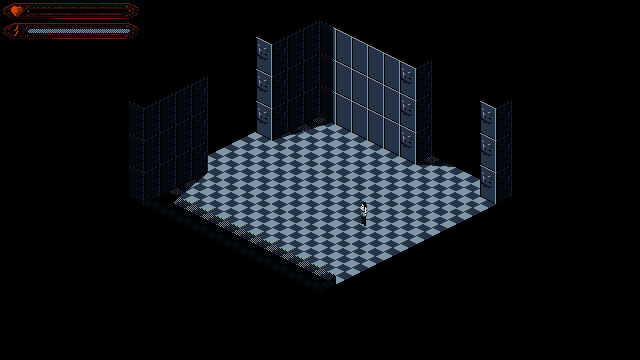 This room is 8x8x4 tiles, but I think 10x10x3 would make more sense. Larger rooms make more sense than taller rooms--and I can always use multiple sectors for deep pits. 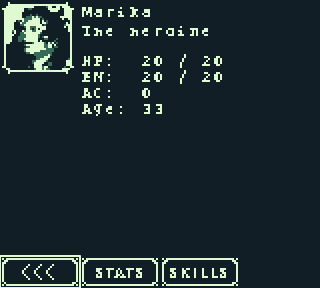 Next up: redoing all my UI assets and title screen art, new fonts, and other odds and ends. Day 3. I got all my UI up and running. Usually I do this later, but I had to configure the screen to 160 x 144 in order to test the margin, tile rendering routines, and such. Before I reconfigured the screen to 720p so that I can use the editor, I figured I might as well get the UI stuff updated. Like in Idosra, inventory items are represented as cards. I only have room for 15 cards on the screen, but I'm not planning a large game so that should be enough. Eh... I think I can do better than that. I'll come back to it if I have time. It functions... and I may end up needing the extra space for longer item descriptions anyway. I decided Marika should be 33 years old. I haven't yet decided just how to work this game in with the others. Age 33 gives me plenty of room to make her younger if I want a prequel, or older for a sequel. Day 4. 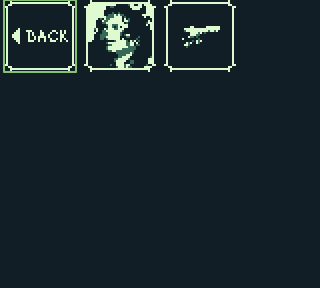 I've decided to drop out of the GBJam 6. Vallas Engine just isn't stable enough at this point to use it for something like this. It's close, though! But with only two days left and I have a full schedule at work, I don't see finishing it on time and doing something I'd be proud of happening. I'd rather make a good game than a fast one. I decided to keep working on it, though. I really like how it looks. I think it's worth spending some more time to give the UI some polish, draw some better sprites, and put together decent sound. The NPCs use AIPawn, and I'll probably just stick to that for the most part. I can work on fancy AI after I finish this game. I think AIPawn will work well with it, but I may make a few more tweaks. I see AI as a larger work in progress that can grow with the series... so I don't necessarily need to play all my cards at once. I have a lot to learn about level design, and something of this scale seems like a good fit. If I give myself too many tools, it'll be harder to learn to use them. It failed the play test (mis-rendered rooms not shown), but I already think I know the culprit and don't expect the repair to take very long. Thats a pity but a very good decision. I love the visuals btw. They have a very unique style. Yeah, it's too bad I had to exit, but it's not like the work will go to waste, either. I also ran into a couple more unexpected issues with the renderer. One is a bug. I can fix it if I'm persistent enough, but the other issue is more mathematical in nature. I've been getting a lot of weird clipping issues... nothing usually that noticeable, but moving to the Gameboy scale made them worse. When you make problems worse by working in a smaller scale, one culprit is round-off error. It's actually apparent in one of the screenshots I showed. The other error pertains to the now infamous "LD03". The whole notion of "occupiable volumes" and "topological sort" that I explored earlier in the summer works well in theory, but I'm now discovering there are a few flaws when I put that idea into practice. The first problem is that placing an actor into the right volume is clunky. Since actors aren't points--their bases are circles--they can occupy multiple floor subsector segments at the same time. Figuring out which layer to draw an actor on necessitates so much code running in my equivalent of an "always" event that I have to wonder if it wouldn't be faster... or at least almost as fast... to just draw every pixel of an actor one by one. Drawing the actors pixel-by-pixel would vastly simplify the motion code. I wouldn't have to worry about what layer to draw an actor on. Once I construct the scene, I smash everything down onto one layer, store the (gx,gy,gz) grid coordinates every pixel maps to, and then draw an actor's pixel on top of the map pixel if the actor is in front. 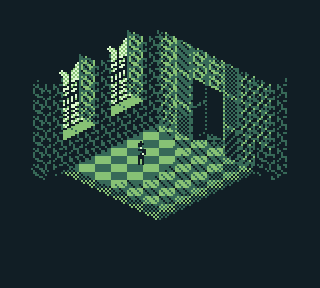 Since I'm using an isometric perspective, this is a very simple calculation (depth=gx+gy+gz), so the only real expense here is updating the bitmap. I also know how many pixels I can draw and maintain 60FPS. Since I'm thinking only drawing actors, I'm only talking about drawing thousands or tens of thousands of pixels. That's two to three orders of magnitude below the millions needed to start to see a significant decrease in FPS. I was already thinking about this before the GBJam 6, just not expecting to put it into action. But what got me started thinking about it was the question...how am I going to light actors? It doesn't make much sense for a fully lit actor to stand in the total darkness. Another question... what about shadows on actors? I wouldn't be able to draw long, deep shadows cast by actors without a lot more revision... especially to the shadow casting code... but I can at least draw a little dark spot on the floor under each actor to help with positioning. It's been mentioned a couple times in this thread before--the original Temple of Idosra was made more difficult by the lack of this shadow. It's worth at least testing. A lot of the code I wrote for the original "occupiable volume" system is still applicable. I still need the topological sort, for instance. I have very modular code, so I can easily adjust what different functions do without rewriting them entirely. Day 4. 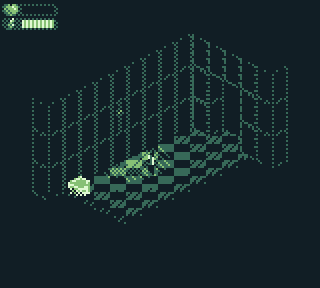 I've decided to drop out of the GBJam 6. Vallas Engine just isn't stable enough at this point to use it for something like this. I don't see finishing it on time and doing something I'd be proud of happening. I'd rather make a good game than a fast one. There are interesting points here. * Good game versus fast game. Fast game is good for game development / designing aspect. And to try to make something that is relatively new. A Jam is also good for actually forcing you to produce stuff rather than start a project and never finishing it. That is a tough one. Everybody has a different goal/benchmark/standard they give themselves. Some people have a very high bar and are almost never able to produce to that standard. So that leads to frustration. themselves that they have made the goal : to make something in the time given with a theme that was provided. Personally I rarely complete a jam in the time given. mechanics/game play or whatever made me work on the game to begin with. That leads to: most of the time a jam produces a way of working or a core functionality that there wasn't before. 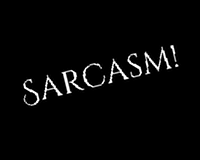 graphics, sound, intro screen, tutorial. Life and bugs will need to be faced during the making of a jam entry. I believe you have learned a lot and tested your engine in a way you wouldn't have thought of before you started. Maybe for next year you have tweaked the engine to use for a new lowrez challenge!?!?! A lot of the code I wrote for the original "occupiable volume" system is still applicable. so I can easily adjust what different functions do without rewriting them entirely. One thing I've definitely taken away from this is the necessity of the "new" renderer. Over the past couple of days I sketched out a plan and I think I can add some of the features I want without drastically increasing the CPU overhead. "Direct draw" on top of the wall bitmaps makes more sense the longer I think about it. I went back through this thread and realized there's a clear trend emerging: any time I represent a larger 2D or 3D shape using a single point, there's trouble. Lowrez challenge might be interesting. 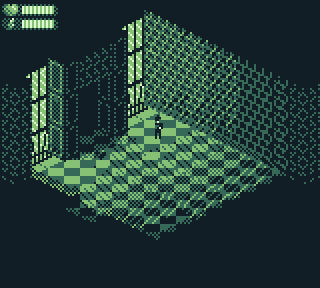 The last game I made was fully 3D, and really I think it'd be more interesting to apply what I learned about 3D graphics to make another 3D game rather than an isometric one... although it would be really tempting to try using my game engine again for something like that. I've started referring to it as "Vallas APRG Engine" instead, since that's really a better description of what it is. It's optimized for action roleplaying games... although turn-based could easily be done, too. The 4 to 8 hour rule makes a lot of sense. If I think about my most successful LD Compo games, they all had simple mechanics. "Fragmented Reality" was a basic 2D platformer that used the Jump and Run kit. "Oregon Trail Hot Pursuit" just had dialogs and menus. Both of those scored very well, and I was done with the basic game easily by the first day. My other games were a lot more ambitious. Even though I really liked them better, they didn't score nearly as well. Edit. Here's what the window is supposed to look like. This is still using the old renderer, although with the floating point conversion bug fixed. Hopefully next screenshot will be with the new renderer. Housecleaning. The new renderer is coming along fairly smoothly. I've ran into a couple of unexpected bumps, but I do have something visible after Day 1. One thing I've done is separated the point-in-shadow problem from the rendering problem. Originally, the renderer looped through every (sx,sy) pixel coordinate, determined if that pixel was in a shadow, and computed the appropriate color. Now I loop through every (sx,sy) pixel coordinate, determine if that pixel is in a shadow, and store a true/false value. This is a separate process from the renderer. The renderer simply reads the true/false value stored in the map. One reason to separate this is that I can change light values without recomputing the effects of every single light. While I have the renderer streamlined pretty well, casting shadows is still computationally intensive. I can now have "permanent" and "temporary" lights--and move the temporary lights without redoing the calculations relevant to the permanent ones. The renderer currently isn't reading the shadow map, but it's there in memory. Once I get that part installed, I'll be back to where I was--and can then move forward. The renderer simply reads the true/false value stored in the map. One reason to separate this is that I can change light values without recomputing the effects of every single light. That is clever. So the render loop and the 'light-loop' can run at different intervals. The renderer probably loops faster than the need of shadow recalculation. I'll be back to where I was--and can then move forward.